Welcome to San Francisco's Chinatown, the oldest Chinatown in North America. While you are exploring its rich history through busy streets and alleyways, be sure to come in for a taste of the best that Chinatown has to offer. Chinatown Restaurant is located across the street from Portsmouth Square on Washington Street. 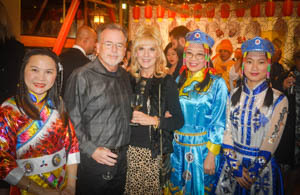 We serve dim sum, seafood, Peking duck, and traditional favorites from the north and south of China. We are open everyday 10 AM to 10 PM. Our 3 floors of dining include a banquet hall for large parties of 50-200 guests, a VIP room for parties of 20-30 with a giant round table that seats 20, a balcony overlooking the park, and main dining areas for walk-in guests. For tour groups, student trips, and company parties please send us an email to discuss special group menus and discounts. We are at info@chinatownrestaurant.com. Let us host your next event for 20 to 200 people! We offer buffet-style, family-style, and banquet-style dining. Perfect for tours, student groups, companies, weddings, and birthdays. Email us for more information! Reserve the entire 3rd floor of our restaurant for your next event. With an Audio/Video system and privacy, the space is ideal for wedding banquets, office parties, and group meetings. Located in a private room on the 2nd Floor, our VIP room features a large table for 20 guests plus additional seating for hosts. It's perfect for birthdays and small group gatherings. The 1st floor is a more casual setup for medium size groups in a different area from regular diners. Great for family gatherings. 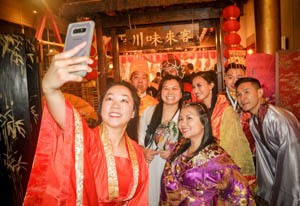 Reserve the entire restaurant to host a unique theme-party with festive costumes, live music, singing and dancing, indoor street food market, and a celebration of Chinese folk traditions. 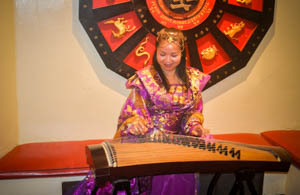 For more information, please contact us at info@chinatownrestaurantsf.com. Order à la carte or try one of our combination menus to get a taste of many different things. When was the last time you had "char siu," sliced BBQ pork? It's time to relive your favorites and try some new dishes. Our favorites here are the Salt and Pepper Crab, BBQ Pork Buns, Peking Duck, and Hong Kong Style Crispy Noodles. We also serve a selection of beer and wine, sake and soju, as well as tea and desserts. * Including Christmas, New Year, Chinese New Year, July 4, Thanksgiving. Every day.